I've been reflecting a bit recently on my quilt-making journey, the stuff/people that have influenced me and the things I've worked out for myself and thought I might do a few short posts sharing some of it. The first, absolutely most important, moment for me was reading The Fabric Makes the Quilt by Roberta Horton. 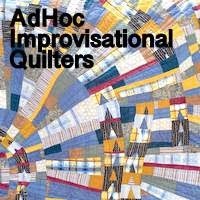 She set out some simple rules for approaching a new (to me) way of quilt-making and reading the first of these was my lightbulb moment. It was 'the line should not be straight'. That's right, the line should not be straight. Yippee!!! No straight lines. Straight-ish lines instead. My lines had never been straight, even when I tried, but now I didn't have to. I stopped using my ruler, started cutting free-hand and have never looked back. In fact I get less straight with every quilt that I make! I know quilting is all about straight lines and perfect corners, but this is so much more in tune with who I am and has really freed me to make the quilts I want to make. Linking up to ayliN-Nilya for Monday Makers, Lee at Freshly Pieced for WIP Wednesday and Nina-Marie for Off the Wall Friday. That statement takes the mathematical element out of the design and leaves you a far wider scope for free design. These quilts look so dynamic, I kind of love the unexpected look. Thanks for sharing your thoughts and I'm totally with you. Somehow I always try to have perfect edges and straight lines but it never happens to me. :-D that's totally ok, because this is me! I love it. I just put it on my Amazon wishlist for whoever draws my name at Christmas. Love that Roberta Horton book, it's a keeper!